This CellML model is based on the author's original code (published on Richard Bertram's website). The CellML model runs in both OpenCell and COR and can reproduce some of the results from some parts of figures 3 to 9. 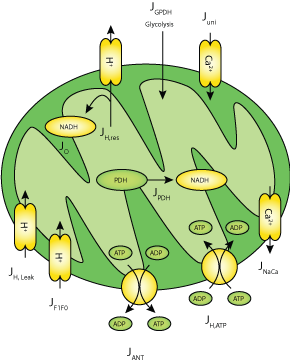 ABSTRACT: Most of the adenosine triphosphate (ATP) synthesized during glucose metabolism is produced in the mitochondria through oxidativephosphorylation. This is a complex reaction powered by the proton gradient across the mitochondrial inner membrane, which isgenerated by mitochondrial respiration. A detailed model of this reaction, which includes dynamic equations for the key mitochondrialvariables, was developed earlier by Magnus and Keizer. However, this model is extraordinarily complicated. We develop a simpler modelthat captures the behavior of the original model but is easier to use and to understand. We then use it to investigate the mitochondrialresponses to glycolytic and calcium input. WWe use the model to explain experimental observations of the opposite effects of raising cytosolic Ca(2+)in low and high glucose, and to predict the effects of a mutation in the mitochondrial enzyme nicotinamide nucleotide transhydrogenase (Nnt) in pancreatic beta-cells. Schematic diagram of the fluxes and reactions used in the model. Derived from workspace Bertram, Pedersen, Luciani and Sherman 2006 at changeset ccce6e569232.